Ryan Grossman, miller at ENZO Olive Oil. Varieties of olive oil on display. The Fresno Food Expo was a huge success this year, as we learned in our article, "2016 Fresno Food Expo, Nation’s Largest Regional Food Show." The culinary diversity and skills within the community shined, and brought the most successful show so far. 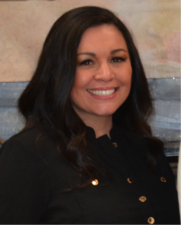 We were able to get in touch with Amy Fuentes, the manager and organizer of the Expo, and hear not only about the success of the Expo, but about her own personal achievements, as well. Tell me a little bit about yourself. How long have you been the organizer for the Food Expo? Do you organize other events, as well? AF: I have been managing the Fresno Food Expo since it started in 2011, when I worked in the office of Mayor Ashley Swearengin. I began working for Mayor Swearengin at the beginning of her term in 2009 to develop one of her platform’s key initiatives, to support and promote locally owned businesses. The original idea that spurred the Fresno Food Expo was to connect our region’s largest export oriented industry with new customers, primarily retail and foodservice buyers, in turn spurring the growth of these companies in our region. One of our first key steps in developing the Fresno Food Expo was to develop an Advisory Committee of key industry leaders to see if this concept would work. After bringing together our region’s largest food industry leaders it did not take long for the idea to resonate. In 2011, the City of Fresno, in partnership with Cohen Communications, MJR Creative Group and David Nalchajian, Inc. and the Fresno Food Expo Advisory Committee, launched the first annual Fresno Food Expo with 65 exhibitors, 198 buyers, and approximately 475 people in attendance for the evening’s public event. This is the only event I officially organize, as event management is not my background. I grew up in Fresno, and attended Bullard High School, where I graduated in 2000. I left the Central Valley to attend UCLA, where I graduated in 2005 with a degree in Political Science and History, and a Minor in Public Affairs. Shortly thereafter I returned to Fresno to attend California State University, Fresno to obtain my Masters in Public Administration, of which I received in 2007. My first official job out of college was at the Greater Fresno Area Chamber of Commerce, where I was their Government Affairs Manager, lobbying on issues on behalf of the local business community to local, state and federal elected officials. It is from that economic development circle that I met Mayor Ashley Swearengin, who invited me to join her team when she took office in 2009. My path took me from the political and public sector to the private sector, where I have been very fortunate to work for, and deeply appreciate, our region’s food industry. How many years has the Food Expo been around? AF: The 6th annual Fresno Food Expo just passed on July 28, making it approximately 5.5 year’s old since it was launched on March 11, 2011. Would you say this year was the most successful year so far? Pappy's Seasonings prepared tacos for the Fresno Food Expo. AF: Absolutely. Not only did our exhibitor and buyer attendance come in at an all-time high with 132 exhibitors and 946 registered buyers, but this year really brought a different, and more exciting vibe on every level. We saw more exhibitors really promote their attendance at the Expo, creating a buzz through our social media channels, and elevating the pride we have for what we do in our region. That pride was seen and felt on the show floor. In addition, not only did we have more buyers attend this year’s Expo, but we had new high quality buyers attend this year’s Expo. For example, we saw new retailers like ALDI, El Super and TJ Maxx Companies, over 21 international buyers and a ton of new interest from restaurateurs and chefs from around the region. Another very exciting aspect about this year’s Expo, that truly made it different than any Expo in the past, was the incorporation of local chefs and restaurateurs for our public event, now called Expolicious. This year’s Expolicious featured 10 restaurants from around the region who were tasked with developing small bites that incorporated at least 2 products from the Expo show floor for a friendly competition judged by our special guest from the Food Network, Simon Majumdar. The addition of restaurants really helped to tell the story of food in our region, from where it is grown and manufactured to how it comes together on the plate. What's the ultimate goal of the Fresno Food Expo? What kind of people/businesses do you want attending? AF: The mission of the Fresno Food Expo is to provide a platform that increases the commerce and connectivity of Central California food and beverage companies, while creating a regional identity centered around the celebration of food production and the experience food inspires. Our audience is Central California food and beverage industry related companies, local, regional national and international retail and foodservice buyers, our local foodie community, and media platforms centered around food. Does something like this help small businesses garner awareness & customers? Absolutely, over the years I have seen a handful of businesses use the Fresno Food Expo to launch their business, many of which now have products on retail store shelves and are being exported around the world. In addition, we have the Fresno Food ExpoNew Product Awards program, presented by Baker Peterson Franklin, CPA, LLP that recognizes new product and packaging innovation through two distinct awards, including the Buyer’s Choice Award and the People’s Choice Award. Is there anything being done to continue the success of the Food Expo? AF: We are working to expand our platform, potentially developing Fresno Food Expo-related events throughout the year, all meant to continue to heighten the awareness of Central California’s vibrant food industry.